After months of waiting, finally Reliance Jio opened its 4G network for public through an invite system. Now non-RIL employees get a chance to experience Jio 4G network under Jio Preview offer. The catch is, you need to get an invite from a RIL employee and you need to buy a Lyf handset. These two hurdles are not too hard to cross as RIL has over 1 lakhs employees and each one gets 10 invites, that’s over 10 lakhs invites out there. Further, Lyf handset may not be the best handset out there, but it starts at little over Rs 5000. So what’s in it for you? As a part of the Jio-LYF Preview Offer, you get a Jio SIM with unlimited voice, video, data and SMS benefits. 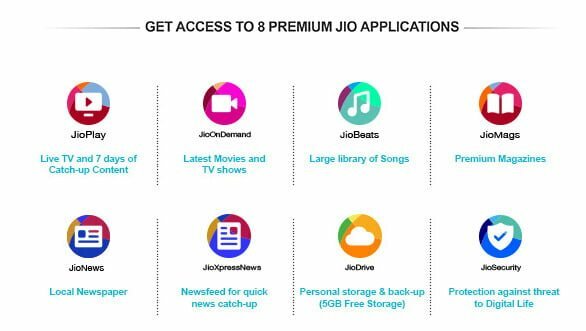 In addition, you can avail of a free subscription to 8 premium Jio apps. The connection also include free national roaming, however there is no international roaming under this offer. We have been led to believe this is kind of a true unlimited offer without any FUP or any limits. With an average speed of 30 Mbps for 4G, you could do endless downloading 24×7. That doesn’t mean you can download terabytes of data and bring their network down. In a sense Jio wants to stress test their network, but don’t want their network congested all the time. Jio has clearly mentioned in its terms and condition, the unlimited offer is only for individual use and any commercial or misusse if found, the connection can be blocked at the discretion of Jio. So it is better to keep your data usage to few hundred GBs. How to get Jio Preview offer? If you are ready to buy a Lyf phone and know any RIL employee who has the invite, you are all set. Step 1: The RIL employee has to enter your email/mobile no: in Jio invite portal for you to get the invite from Jio. Step 2: Once you receive the invite from Jio, take a print out of it and visit nearest Reliance Digital Xpress store. Step 3: Buy any a Lyf phone of your choice to receive Jio SIM with preview offer. Steps 4: The process is same as taking a new SIM card and you have to give your documents to get the Jio SIM issued in your name. Step 5: Once the connection is activated and tele verification is complete, you can start using your Jio connection on your Lyf phone. Note that the preview offer will work only on Lyf phone. Aso the invite is valid only for few days and has to be used before the expiry. If you are thinking this is just for Jio fan boys who have been waiting impatiently, its time to do little math. What keeps many away from this offer is the fact that this connection will work only on a Lyf phone. With an initial investment of Rs. 5,499(Lyf Flame 1) you get a smartphone and unlimited everything for 90 days. When was the last time you got a similar offer? I remember it as RCOM CDMA offer for unlimited data at Rs 949 or the more expensive Zero plans. But it wasn’t 4G and was not fast enough. Now the hard part is finding a RIL employee and getting the invite. Jio is trying to accomplish two things with this preview offer. One, get those Lyf phones off the shelfs. Two, do a real world testing of its 4G network. Lyf phones which is now claimed to be the 5th largest smartphone vendor, received lukewarm response from buyers and critics. The smartphone market in India, which is dominated by Chinese and local players at the lower end, Lyf brand was struggling to find a life. Jio has now come for its rescue by offering unlimited everything for Lyf buyers. Even though Jio claims its employee launch was a big success, how of its employees really care about 4G and Lyf. Most of them will stick to their current phone and network till Jio is commercially launched. Jio need real mobile enthusiastic to stress test its network and reveal potential problems before going for full commercial launch. The invite system is put in place to ensure just enough number of users are in for the beta testing and not anyone who can afford a Lyf phone and get to misuse the unlimited offer.